Because the major appeal of a graveyard is the way it looks, overseers will need to make sure that the grass is kept from getting brown. Lush, green grass will encourage visitors and will also allow the entire place to exude peace and serenity. Special fertilizers can be brought in to do the job. 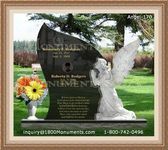 If flowers are to be placed near certain headstones, they will have to be removed at regular intervals. In most cases, caretakers will come around and remove the flowers after a week or so. This ensures that the flowers will remain fresh and will be taken away from the area once they have become brown and stale. If the grounds are surrounded by a brick wall or an iron gate, this area should be kept in perfect condition. When a segment of the wall begins to degrade, it should be repaired as soon as possible. This will keep intruders out and ensure that no vandalism occurs during the night hours.